J'ai eux cette monture sur dalaran le 25/11/2014 avec mon mage ice 634 ilvl facile en restant a distance car au cac il fait beaucoup de dégats. solotable sans souci. bonne chance a vous. J'ai aperçu ce rare au sud-ouest de l'arène. Facilement solotable, il dispose de 2000k de vie environ (je suis war tank), si vous avez le bâtiment avec le démolisseur c'est un plus. Bonne chance aux farmeurs ! Je l'ai tué avec mon guerrier à l'époque full pvp 660, je pensais que c'était un rare lambda et ne savais pas qu'il lootait une monture, je l'ai trouvé hyper corriace, j'ai du utiliser popo soin et de burst durant le figth. Drops Foule-prairie tacheté in Nagrand, around Stonecrag Gorge. Found this rare around Stonecrag Gorge in Nagrand! we didn't need to be in A group to get loot and we all got the mount. If it stays like this during live please dont rush and kill it like Timeless Island please wait on others to join. Luk'hok is one of 7 new rarespawns with associated mount drops. Luk'hok drops Foule-prairie tacheté. Warlords of Draenor adds 4 variations of elekk mounts, with this being an unarmored tan version. Been camping these rares with some people i randomly met, one of them called me about this guy spawning, was around 23:40 EST, he spawned on a spot north of stonecrag gorge, i suspect he paths in a circle around the gorge, i posted a screenshot of the place and mount. Killed this guy today, 1 hour after servers were up, took me as a hunter with a tanking pet and a shadow priest to kill him around 15 min, so so many misses, spot was north east of stonecrag gorge, near a dead clefthoof being eaten by carrion birds. Just killed him on Lightninghoof. Loot window showed up empty and then was giving the "You don't have permission to loot that" error until the corpse despawned. Was riding a demolisher when it died. Opened a ticket. Not sure if bugged or not. For what it's worth, reported kill on Suramar/Draka @ about 18:00 server yesterday. I did not witness the kill myself. On Frostmane they just killed him. He wasn't even close to your previous locations. He apparently spawned and got killed just north of Mar'gok's Overwatch. EDIT: I would like to add that this information could be misinforming. I was simply addin' the fact I got. He may have very well been kited there and mistaken for spawned. I cannot confirm any of this as I was not present. -por lo que escuche de respam no estoy muy segura pero creo que no tiene nada que ver con ningun rare más, es decir no es como el protodraco del tiempo perdido que comparte cd con otros rares. unos dicen que tarda cerca de 20-28h en salir asique no aconsejo quedarse despiertos si lo han matado hace unas pocas horas. Received the mount on my first kill of Luk'hok. Not sure if that means the mount is a guaranteed drop or if I got lucky. Also I was not in a group when I killed him so as long as you tag him you will get credit for the kill. Killed him today near the throne of elements @ 75,30 think he also spawns over there, cause he just moved a few steps to the left and rigth! I found him just south of The Ring of Trials. He paced back in forth on the hillside staying pretty much in the same place. in the area under Hallvalor shown on the wowhead map. Confirmed to spawn just South East of The Ring of Trials in Nagrand. Was camping for Nakk the Thunderer and went on a patrol to look for Luk'hok and randomly stumbled upon him. Pulled him to The Ring of Trials to use it as a better reference point to get people here. Had a full 40 man raid group, seemed that people NOT in the group had trouble seeing it if they were in another group. I believe this is due to Blizzard's new implementation of the server-wide instancing for raid groups. Anyways, got about 60 people there their mounts and went back to camp Nakk. Have yet to see him. Note: A good way to keep him alive is to Polymorph him (causes him to evade/immune heal) or chain cyclone him. Killed today EU-Moonglade @ 14:15pm Spawned north of Mar'gok's Overwatch. Killed Luk'Hok about 1 hour after I killed Pathrunner :) Dropped the mount only. it's very cute! got him last night with whole raid on arthas server awesome mount! him and pathrunner in m collection now :) ! The Oprah of all mounts! You get a mount You get a mount! After reading a post about Luk'hok being tied to the timer of Pathrunner (talbuk mount), I was lucky enough to witness a kill of Pathrunner in chat, I was unfortunately unable to get to Pathrunner in time, but just to test out some theories, I went and stood at a known spawn point (66,44). 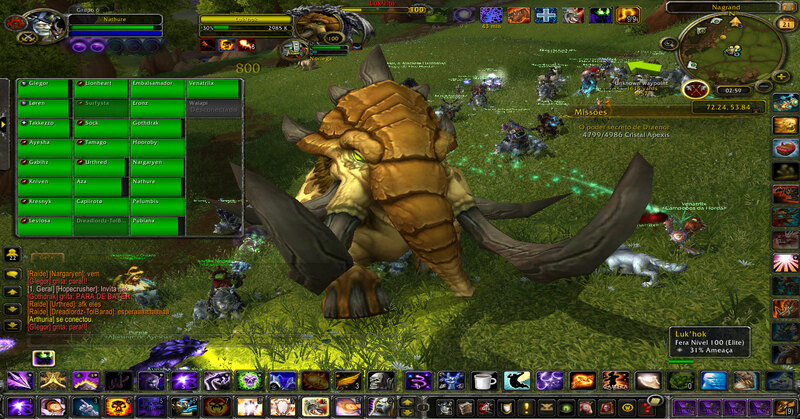 He spawned 10-15 minutes after Pathrunner was killed right in the spot I was standing. This was 10:10 pm server time on Moonguard. Luk'hok spawned and downed on Anvilmar at 1640 hours. 11/20/2014 just far enough NW of Yrel's Watch that NPCscan missed it. Thanks to a friendly passerby I helped down it. It spawned on the spot marked on the wowhead map. Sorry forgot to screen shot... too excited. My group found him at 72.2 53.8, after 14h22min of the realm reset (Azralon-US). With that, we have 5 possible spots for this mount. Confirming spawn location ~72, 54.5 west of the "ring of blood" text on the map. it's not marked on the map above. Happy hunting! Killed around 01.10 on Sylvanas-EU. People saw him about 5 earlier, though most of us werent able to see him due to phasing issues. After he got killed I tried my luck to check his spawnpoints in "my phase" and I found a DK soloing it in the spawn near Throne of Elements. Tried to invite as many as I could, and afaik all people in the group got the tag and the mount. Cheers to the DK who chilled on him after I told him so. Basically this confirms totalnooblets theory about each phase having their own spawntimer, as he spawned twice within 5 minutes in two different phases. Well, having all 7 rares, I guess it's safe to say that my rare-camping is over for this time. has been killed on 15/12/2014 23:57 on argent dawn europe. Just killed on Earthen Ring. Not quite sure how rare he is but I just solo'd him and it was fairly easy, just took some time. Found this dude while entering Nagrand for the first time on the character in question, off to the right just past the wrecked caravan. I hadn't seen a rare there before but was on my L88 blood DK in DPS gear so just charged in ... noticed the L100 and almost 3M HP and thought (1) this is going to take a while and (2) maybe this is something cool. No idea who the NPC was otherwise. So, after around 10 minutes, voila, surprise new mount! Somewhat to my surprise no one else even noticed the fight. Me and a horde just killed this lad on Aszune EU 2.45am Realm Time at around 66,44 coords. Called out in chat he was up but no one came, was up for a good while before horde hunter engaged, I joined in with my rogue, wasn't too difficult but couldn't solo him as I tried and failed. Just killed at approx. 6:30 pm Cairne server time at cords 76, 30. Tiny little Elekk mount......very easy kill just tag it and it drops the mount, no faction tag, I was the only Alliance there with a ton of horde. For those that are interested, killed at approximately 7:15am AEST on 2nd of January on Saurfang. Myself, 100 BM Hunter, used a tanking pet. Killed it with the help of Rathmanis, 100 warlock. Just got him on the Nordrassil server. 73,54 - left of the Ring of Trials spawn point. So the point is: rush in and get your tag the moment you see him up. ZA little into the fight I stopped and did a /yell with the location so others could get there tag as well, which they did. So that was really cool. Oh well lucky 12 got him! Just soloed him, 649 Ret Pally. It was pretty easy, just jump away when he does the wind up crush thing.I didn't even need to heal or bubble that much. Just don't pull anything around him and you'll be fine. Instead Nok-Karosh, all other mount dropping rares are Neutral. Means they are shown in yellow and won't attack you if you don't attack first. Got mine in the 66/43 spot today. Some kind player from another realm made up a group even though they already had the mount themselves. I had my alt parked in nagrand so I logged that character, joined the listed group and got the kill. Usually the rare is dead already by the time I join these groups but today was a happy exception! I just soloed this guy. He was walking around. No one was attacking him. He wasn't grayed out. Spent 10 minutes killing him, yet it said I didn't have permission to loot him. Encountered this guy today at 13.28 UTC at 72,54 in Nagrand (obviously). As a level 98 fire mage, I just ran around him spamming Scorch (thanks to Improved Scorch he never got near me), Inferno Blast and Pyroblast whenever it procced. Adds weren't a problem as DoTs took care of them. According to recount, the fight took 9 and a half minutes. Saw someone kill him at 3:10, started camping him 6 hours later and he spawned at 10:50. So about 7 hours 40 mins spawn time for me. During BFA's launch, I spent my time on an alt hunting rares in Draenor, which were always up. Like taking candy from a baby, because no one else was hunting them. But Luk'hok... darn it... I was wondering if the mob still existed! 3 days of off and on flying around, looking and looking for Luk'Hok. SilverDragon and NPC on. Checking over and over again to see if they were working... And the worst of it was that I didn't even really like the way the mount looked on the 3-D model. Why was I doing this? It was ludicrous. But finally, I was like, eff this, and took 'my one last lap' (It's always on the last lap that the mount drops, duh. Why would you do more laps after the drop?) but on my SWEAR TO GOD THIS IS MY LAST LAP AROUND, okay... maybe the EIGHTH LAST LAP EVER, he shows up. Just have to persist. That's it. AND... the mount looks a lot better now that I'm riding it. Very nicely proportioned, interesting detail and good animation. Luk'Hok still exists as of 9/12/2018, even though you may not believe it. Ce PNJ se trouve dans Nagrand (18).